Laying hen husbandry and egg production in Canada are unique because of the Supply Management system which controls production volume, egg prices and egg trade. The system is organized in a way that all stakeholders in the supply chain can generate profits. Laying hen husbandry and egg production in Canada are unique. For a period of almost 50 years, the production volume and the price of certain food has been controlled by the so-called Supply Management system (McIsaac, 2008). It was implemented in the 1960s when dairy farmers were confronted with severe economic problems because of the volatility of milk prices. They demanded means to control the prices, the production volumes and imports. In milk production such a system was implemented in the 1990s, later it was expanded for eggs, broiler and turkey meat (Clarke, 2016). Farmers have the possibility to exert influence on the fixing of egg prices. It does not need government subsidies. It guarantees a high product safety. It supports family farms and the future of rural communities. This system is, however, criticized by countries which want to export eggs, poultry meat and milk to Canada and have only limited access to the Canadian market because of import quotas. It will be on the agenda of the ongoing new negotiations about NAFTA regulations. Canada only contributes about 5% to the laying hen inventories and to egg production in North America. And it is only because of the Supply Management system that the Canadian egg industry has been able to maintain its independence. Between 1996 and 2016, the Canadian laying hen inventory increased from 17.6 mill. to 25.7 mill. birds or by 45.8%. 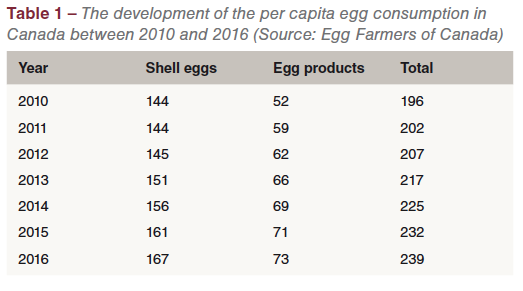 This documents the constantly growing demand for eggs and egg products (Table 1). 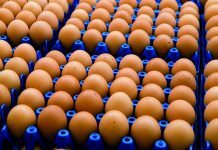 Parallel to this growth, egg production increased from 5.2 billion to 8.2 billion pieces or by 57%. In Table 2, the higher growth rate in egg production is compared to the laying hen inventory. 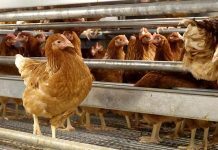 It reflects the success in breeding of hybrid hens with a permanently growing laying rate and improvements in the housing systems. 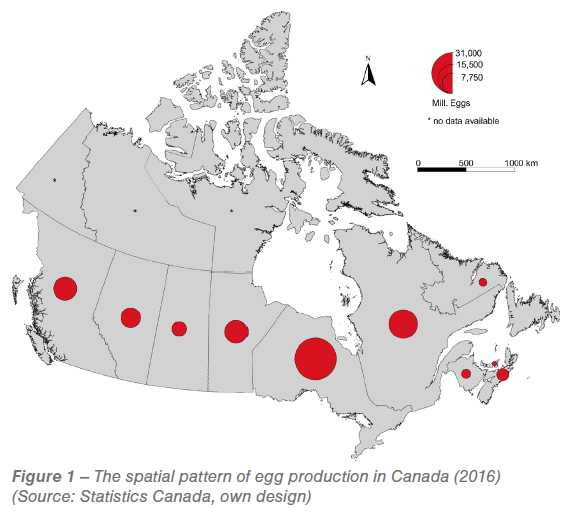 The spatial pattern of laying hen husbandry and egg production in Canada reflect the distribution of the population. They are concentrated in the provinces of Ontario, Quebec, British Columba and Manitoba and their urban agglomerations Toronto, Montreal, Quebec, Edmonton, Calgary and Vancouver. 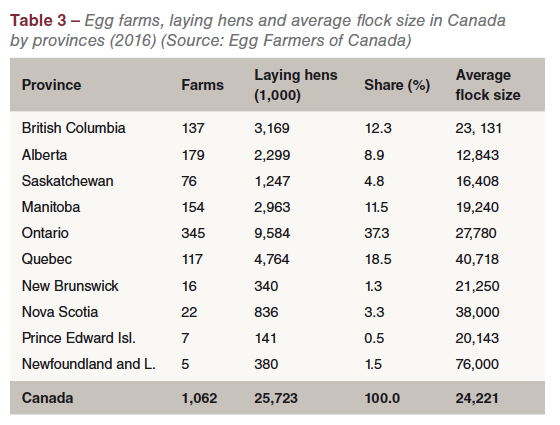 Ontario and Quebec alone share 55.8% of the laying hen flocks and 56.2% of the total egg production which reached a volume of 8.18 billion pieces in 2016 (Table 3, Figure 1). 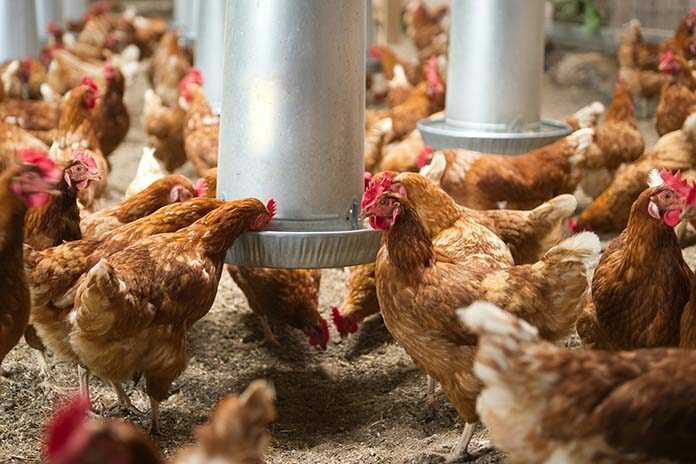 With the Supply Management system, volumes of egg production and market prices are controlled. The system is administered by Egg Farmers of Canada. The organisation determines the annual domestic egg demand and divides it among the provinces (Table 4). The branch organizations in the provinces regulate the production and marketing of eggs. They allocate their share of the domestic demand to the single producers. They also set the prices which will be paid to the egg farmers, depending on the size and grade of the marketed egg. In 2015 and 2016 the average price paid to the producer was 4 CDN-cents/dozen higher than the production cost. The eggs are purchased by graders at the set price and then further sold to retailers. The price which the retailers have to pay is negotiated between the grader and the retailer. 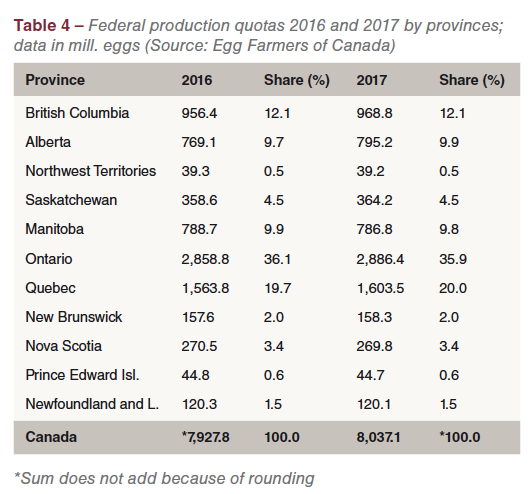 If not all available eggs can be marketed, the surplus is re-purchased either by the branch organization in the respective province or by Egg Farmers of Canada based on the calculated cost of production. Egg processing companies buy the eggs directly from the branch organization in the province in which they are located or from Egg Farmers of Canada. This system guarantees profits for all stakeholders in the supply chain. In Table 4, the production quotas for 2016 and 2107 are listed for the Canadian provinces. With a share of 35.9% Ontario ranks in first place, followed by Quebec and British Columbia. 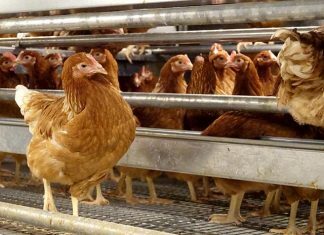 The system sets egg production quotas according to the projected demand to avoid long transport distances and to guarantee high quality fresh table eggs. Despite the Supply Management system, trade with eggs and egg products is necessary to meet the domestic demand or export a surplus. As can be seen from the data in Table 5, the trade balance with shell eggs was negative in the past years. The high deficit in 2015 is a result of the extraordinary price increase for shell eggs in the USA because of the egg shortage following the AI outbreaks in the upper Midwest. The spatial pattern of laying hen flocks and egg production reflects the distribution of the population. Production quotas are derived from the expected per capita consumption on a national basis and then allocated to the single provinces. 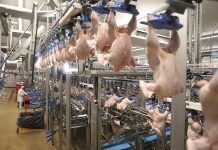 Between 1996 and 2016, the laying hen inventory increased by 45.8%, egg production by 57.0%. Despite the applied system, eggs are imported and exported to either meet the domestic demand or to get rid of the surplus. The Supply Management system may be challenged during the ongoing NAFTA negotiations. Clarke, P.: Supply management is Canadian Genius. 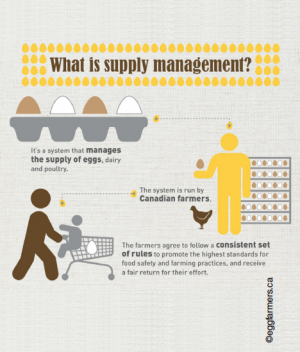 http://www.eggfarmers.ca/2016/08/supply-management-is-canadian-genius. Egg Farmers of Canada (Ed. ): Annual Report 2016. Ottawa. Muirhead, B.: Under Siege: Supply Management as Threatened Paradigm. Ottawa 2016. www.nfu.ca/sites/www.nfu.ca/files/Muirhead.pdf. Previous article2018 VIV Europe: a big success for everybody!